The three rings in these elegant earrings can never be torn from one another, making them a lovely picture of a relationship in which two people are inextricably joined for life. No matter what forces pull them away from each other, they will remain linked together. Shaped from cool, shining 14K white gold, this pair makes a quiet but powerful statement about the insoluble nature of love and about your good taste in jewelry. These petite but stylistically powerful earrings have a sense of timelessness, and their graceful design is sure to adorn your ears over and over. Earrings measure 11mm and have standard push back posts. 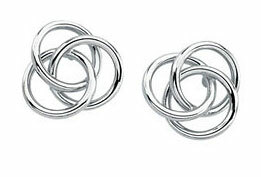 We guarantee our Trinity Knot Stud Earrings, 14K White Gold to be high quality, authentic jewelry, as described above.